The Lockheed F-117A was not only the world’s first operational stealth aircraft, but also one of the most secret plane ever developed. Conceived for night secret missions, the “Nighthawk” was restricted to fly only with darkness. In fact, in each operation from “Just Cause” in 1989 to “Iraqi Freedom” in 2003, the F-117s only flew after sunset. Even if one example was lost in 1999 near Belgrade during “Operation Allied Force“, the F-117A unique design, which consisted in blending different angles, made the aircraft very hard to detect by the air defense systems. But, low observability to radar alone was not sufficient to guarantee the plane to fly undetected through the enemy airspaces. During the development of the F-117, the Skunk Works (the Lockheed legendary division that designed secret aircraft) found that to evade visual detection the best solution was a paint scheme in different shades of gray. However, in 2003 one example of the F-117A was painted in gray with the task to determine if the aircraft could play a role in daytime missions. This Nighthawk was nicknamed “The Dragon” and the operational testing on the type was accomplished at Holloman AFB (Air Force Base), New Mexico, by the 53rd Test and Evaluation Detachment 1 (Det 1). Flying two missions every day Det 1 pilots were able to determine their daytime capabilities and limitations. The new kind of coat proved immediately that the “classic” black paint scheme wouldn’t be good during daylight operations. During the tests “The Dragon” was also upgraded with new software and hardware; furthermore the new paints were evaluated by measuring the impact that the gray had on the maintenance. All these trials were necessary to provide an accurate evaluation of the daytime operations with the gray paint scheme, to ensure a 24-hour stealth presence above the future battlefields. 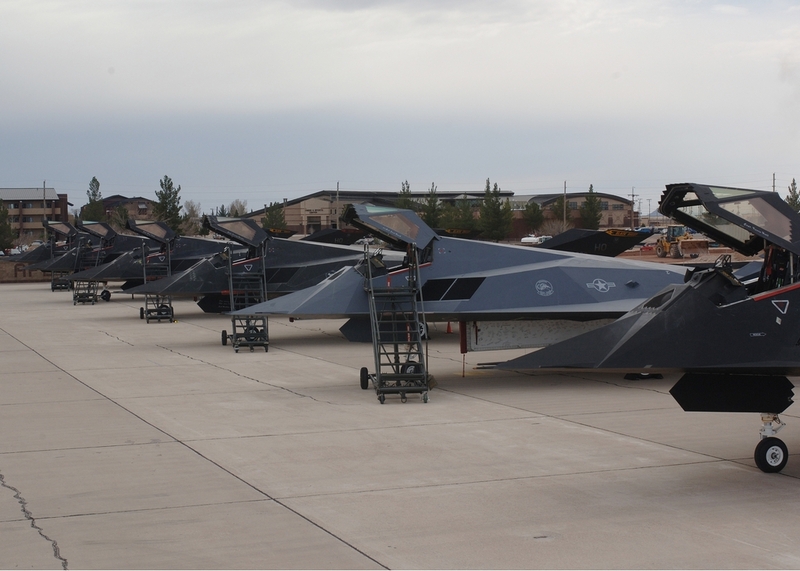 However, despite the good results of the trials, “The Dragon” would have been the only F-117 painted in gray: in fact, in 2005 when the USAF had to take a decision about repainting in gray the entire fleet , it was decided to retire all the Nighthawks. The gray F-117 made its last flight on Mar. 12, 2007 at Holloman AFB.